Cody Asche suffered a setback in his path back from an oblique injury this weekend. 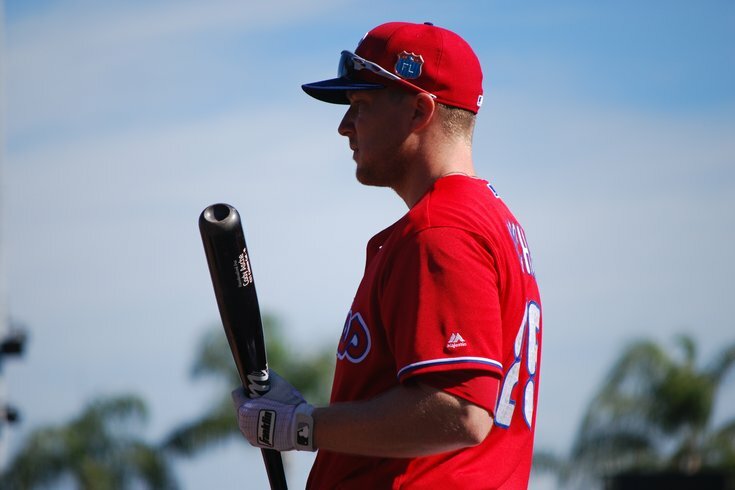 CLEARWATER, Fla. – While the newest outfielder in camp stood in the middle of the home clubhouse at Bright House Field, surrounded by recorders, cameras, and notebooks, Cody Asche paced in the background with a bat in his hand. It was nervous energy more than anything, most likely. Asche won’t be allowed to swing a bat for the foreseeable future. On Saturday, a day before the Phillies reached out to veteran outfielder Will Venable, who agreed to a minor league deal Monday, Asche suffered a setback on his path to joining the Phillies ever-changing outfield. After hitting a home run in his first at-bat of a minor league game, Asche re-injured his right oblique on a swing-and-miss. Opening Day has been out of the question for some time, but now Asche looks unlikely to join the Phillies until at least late April, at the earliest. Asche first suffered the injury five weeks ago, during live batting practice sessions in the first few days of full squad workouts at the Carpenter Complex. He believed it was just a minor injury that wouldn’t keep him from competing for an outfield job this spring; the injury was diagnosed as a Grade 1 strain. But after trying to take it slowly, progressing in small increments in the last month, Asche’s timeline will start all over again. Venable, meanwhile, will lead off and start in left field for the Phillies in their penultimate game on the Grapefruit League schedule in Clearwater against Masahiro Tanaka and the New York Yankees. He was asked on Tuesday morning if he had any assurances that he’d be on the Opening Day roster. Venable arrived in camp a little more than 24 hours before the Phillies will head north for the final three exhibition games on their spring schedule. He is competing with Emmanuel Burris and Cedric Hunter for the final two spots on the Phillies bench; outfielder David Lough and infielder Ryan Jackson were re-assigned to minor league camp on Tuesday morning. Venable said he would begin the season at Triple-A Lehigh Valley if asked. The Phillies also narrowed the field in the race for the final spots in the bullpen: veteran right-hander Edward Mujica was released. With less than a week until the Phils begin the 2016 season at Great American Ball Park in Cincinnati, there are likely four pitchers competing for two spots: left-hander James Russell and right-handers Andrew Bailey, Ernesto Frieri, and Hector Neris. Rule 5 pick Daniel Stumpf is probably close to a lock for a roster spot in a relief corps that's also almost surely to include right-handers David Hernandez, Dalier Hinojosa, and Jeanmar Gomez, and left-hander Brett Oberholtzer.